Following ADEY’s very successful introduction of chemicals to the industry a year ago, ADEY have added a further 5 chemicals to their portfolio each with a specific role to play in protecting and maintaining central heating systems. With the now already recognised MC1 PROTECTOR and MC3 CLEANER established the family grows with the following additions. MC4- LEAK SEALER – repairs inaccessible leaks, weeping joints and helps avoid maintenance repairs to blocked pumps, valves and air vents. 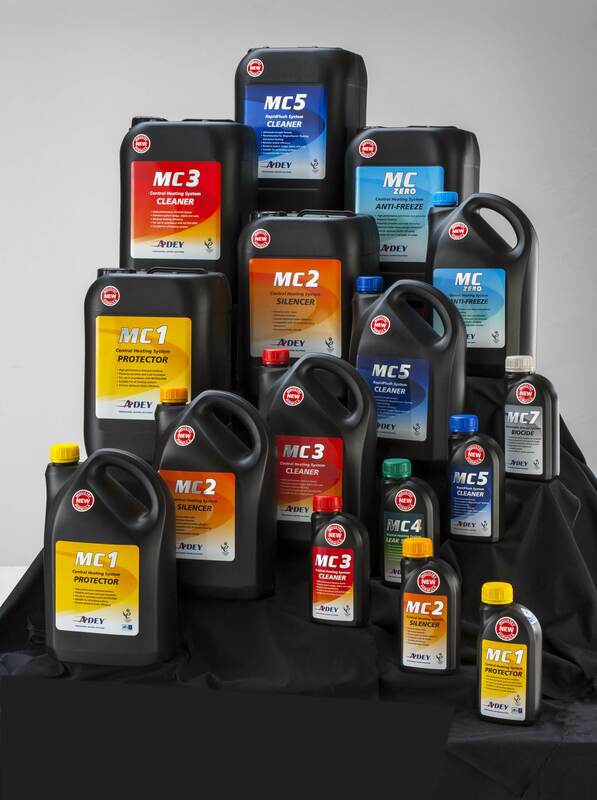 MC5 -CLEANER – is an advanced strength chemical, developed for use with the MagnaCleanse process. MC7 -BIOCIDE – tackles potentially harmful micro-organisms and fungicides removing bacterial blockages in low temperature renewable and underfloor heating systems. This NEW more extensive range is available in 500ml, 5L, and 10L sizes and is available at major merchants. ©Web Design by Philip Whitford All Rights Reserved.